Want to master Creole, Chinese or Italian cuisine or perhaps you’re looking for a how-to class on cake decorating, breadmaking, appetizers or desserts? There are many options in Trinidad and Tobago from recreational classes at the Trinidad & Tobago Hospitality & Tourism Institute to one-day worships and certificate programs at The Academy of Baking & Pastry Arts. THE ACADEMY OF BAKING & PASTRY ARTS (Woodbrook, Trinidad; (868) 609-2253 / info@thebakingacademytt.com) – Offers a wide range of classes for adults (professional certificate programs & recreational workshops) and children in a beautiful space. Recreational classes include classes on quick breads, sushi, world’s best sandwiches, tapas party (see what we made here! ), pastries, knife skills, make-and-take dinner, couples classes, etc. Links to recreational workshop classes in June-July 2017 and upcoming certificate programs. 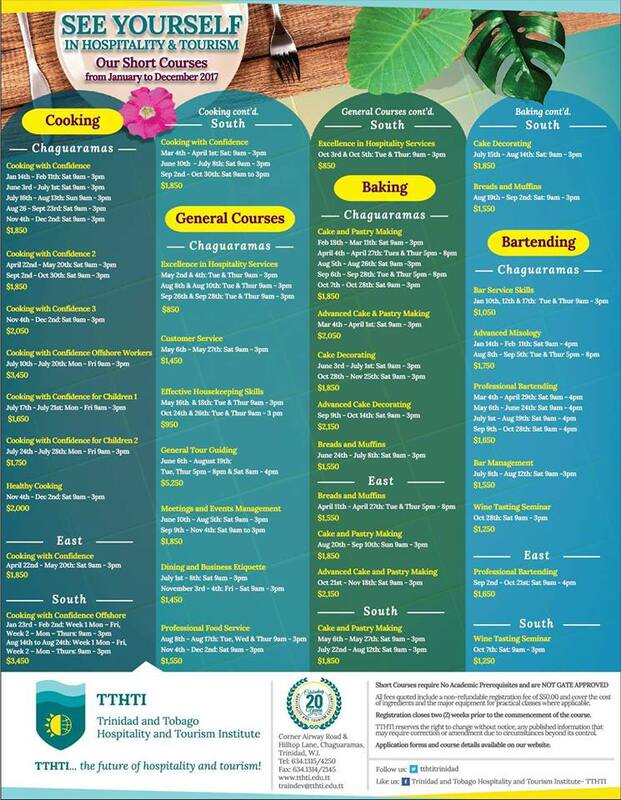 TRINIDAD & TOBAGO HOSPITALITY & TOURISM INSTITUTE (Chaguaramas or Marabella, Trinidad; (868) 634-4250) – TTHTI is a full-fledged academic institution that offers degree programs as well as intensive “short courses” for home cooks like East Indian or Chinese Cuisine, as well as more practical courses like Catering Essentials, Dining Etiquette and Professional Bartending. Class Details – TTHTI short courses do not require academic prerequisites; Courses run from a few days to several weeks depending on the course; (Classes vary in price and all require a $50 registration fee in addition to the class fee). Link to 2017 TTHTI Short Courses Schedule. 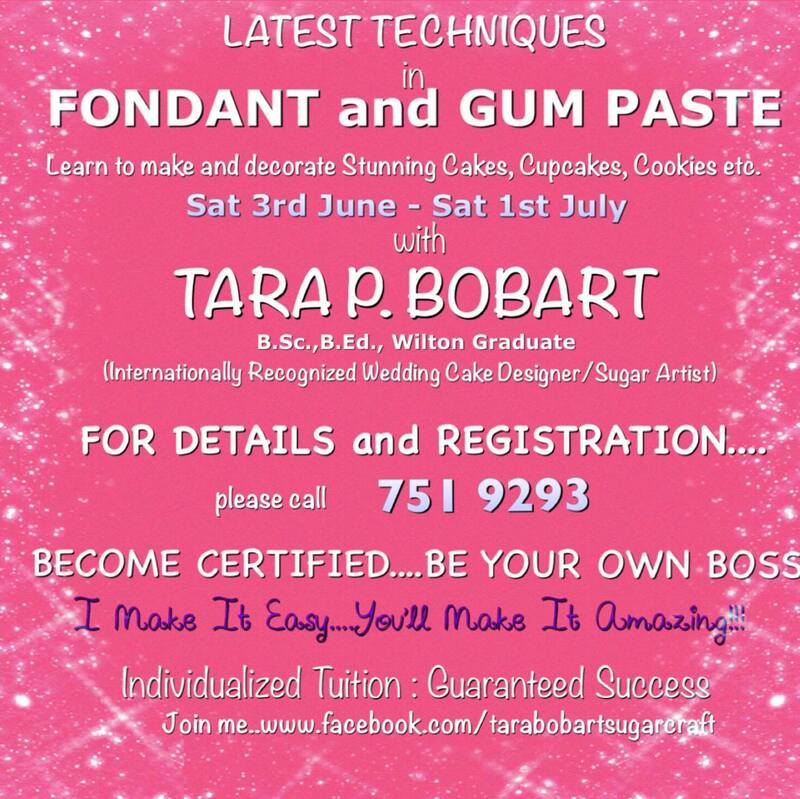 TARA BOBART SUGAR CRAFT (868) 751-9392) – Offers courses in rolled fondant and gum paste techniques, royal icing, butter cream techniques and marzipan techniques. Email address – tarabobart@gmail.com. Link to course flyer. CLASSES WITH CHEF BIANCA BIANCO (St. Joseph, Trinidad). “Classes run for three to four hours, depending on the topic. They usually consist of a brief overview of the menu, a demo lecture, the cooking portion and lunch or supper. There will be an assistant in each class who will be there to familiarize you with the kitchen and point you in the direction of the ingredients or equipment.” Contact (868) 662-7244 or 719-8092 or chefbbianco@gmail.com to book. WENDY RAHAMUT SCHOOL OF COOKING (San Fernando, Trinidad; (868) 357-0927 / rahamut@gmail.com) – Trinidad’s culinary rock star shares her craft at her San Fernando cooking school and in her cookbooks and a weekly Guardian newspaper column. Rahamut’s demonstration classes offer a taste of local and global cuisines like Roti Making, Flavours of the Mediterranean, Baking Bread and Perfect Pastries. Class Details – Classes are generally three hours; Rahamut is the class teacher; Participants can sample food prepared during sessions; Recipe handouts are provided. (One-day classes are usually $500 each). CROWNER’S CULINARY INSTITUTE (San Juan, Trinidad; (868) 686-6646 or (868) 638-2173 or 343-0126) – Offers short courses on Christmas Cookery, Cake Decorating (beginners and advanced), Pastry and Bread Making, Party Snacks, Creole Cookery and Indian Cookery; basic course materials are included with course fees. Class Details – Courses are scheduled for once a week and typically run for four weeks). Links – Crowner’s Cooking School Class Descriptions. CENTRAL SCHOOL OF CULINARY ARTS (Chaguanas, Trinidad; (868) 687-4276) – Helmed by Chef Selwyn Wickham, this school offers a wide range of classes including cake baking and decorating, pastry and bread making, along with general culinary improvement classes. FARA’S CAKE SHOP (Piarco, Trinidad; 868) 294-1900 or (868) 465-0515) – Offers classes in cake making, cake decorating and sugar flowers. Email address is cakes@trini-cakes.com. Link to FaRa’s Cake Shop website. JUST IN TIME CATERING (Woodbrook, Trinidad; (868) 795-7501) – Weekly Cooking Classes covering local cuisine, Japanese, Italian and Mediterranean cuisines, and basic introduction to cooking. “Bring your own personal knives as well as notebooks or any computer devices such as laptops, tablets or iPads.” (Classes range from $250-$300/week). THE STARTING LINE Kitchen Creations by Chef Abigale (Claxton Bay, Trinidad; 868-222-4461 or 1-868-757-8165) – Offers “professional cake design training” and sugar artistry classes. Link to more details on classes. CALLENDER CAKE DECORATING SUPPLIES (San Fernando, Trinidad; (868) 652-5487; 687-9062; 771-6248) – Occasionally has classes on cake decorating. Email address – callenders@gmail.com. FLORA’S SCHOOL OF CAKE DECORATING (Tunapuna, Trinidad; (868) 645-9421) – Offers courses on cake baking, cake decorating, sugar artistry (fondant), royal icing, etc. Contact Flo.das@hotmail.com for class schedules. TOBAGO HOSPITALITY & TOURISM INSTITUTE (Mt. St. George, Tobago; (868) 660-2196) – Offers a wide range of short self-enhancement courses for the general public like Basic Bartending, Introduction to Food Art, Italian Cooking, Pastry Making, Cake Making & Decorating and Dining Etiquette. Email address – info@tobagothti.com. Ministry of Food Production (Agriculture Now) Farmers Training Centre’s FREE TRAINING COURSES – Offers free courses to the general public like Home Gardening; Pineapple Production; Winemaking; Pepper Sauce Making; Pumpkin & Squash Production; Cocoa Production and more. Classes are offered in multiple locations throughout Trinidad. Check the Ministry’s Facebook page or website for the most current class schedule. Follow TriniChow on Facebook to keep up with food & restaurant news in Trinidad & Tobago. Hi I’m looking for a cooking cause to work offshore on a rig can you please assist so I can get certified. TTHTI has offered classes aimed at offshore chefs in the past. Contact them to see if they still offer it. Lots of options on this list, give the places on this list a call for current schedules. Good morning, I have a 9 year old who has a burning desire to become a chef. She has expressed great interest from a tender age of about 3 or 4. Can someone please suggest a cooking school or someone who help her build a foundation in this field? hey, my name is Shuntelle. I’m love baking and I’m interested in doing a cake baking an decorating course…… can anyone say which are the best schools or institues in trinidad? Hello I am looking for cooking classes between the months of June and August 2015 for a 17 year old. I notice that most of the cooking classes for children offered are up to 15 or 16 years old. ..please advise on what I should do. Thanks. Fanatic Kitchen Studio will be offering kids cooking classes in August that may work for you. Also, we’ll be updating the kids’ cooking class list in the next few days, so check back here next week. Hi Kelly, please check the list here to identify potential classes that you would be interested in and contact them directly to determine the cost. Hello, Are there any places in Central that offer Italian and Mediterranean cooking classes. Sorry, not that we’re aware of. Hi Deniase, sorry we do not have 2015 schedules. Please contact the places listed above to obtain their 2015 schedules. I’m a huge fan of cooking and I’m looking for the best institutions and courses that would help hone my abilities and skills in the kitchen. Where Would You Recommend? Preferably in th POS area. I’ve heard about fanatic kitchen studio. Hi is there any where in Arima or Trincity that does cake decorating, fondant and sugar artistry courses? Hi Wardy, we don’t know of any places offering those courses in Arima or Trincity. The Gourmet Culinary Kids Camp is hosting a camp in San Fernando from 28th July to 1st August and it’s open to children ages seven to sixteen years. (868) 330-2668 or (868) 340-5703 for more details and to register. Hi Ria, try Sweet Sereni-Tea (http://sweetserenitea.com) which is located in Maraval. Also, TTHTI offers classes and there’s a location in Chaguaramas (call 634-1315/4250/4456 for the schedule). Try the Wendy Rahamut Cooking School in San Fernando and TTHTI has a location in Marabella and occasionally offers baking courses. hi. im a regional student currently studying at UWI. i love to bake. what places near st. augustine can i go to. Unfortunately, we don’t know of any cooking schools in St. Augustine. If you’re in Trinidad, you should contact the Trinidad & Tobago Hospitality and Tourism Institute (TTHTI) at http://www.hospitalitytnt.com. TTHTI which “offers two-year Associate Degree programmes, as well as diplomas and short courses for full-time and part-time students.” If you’re in Tobago, contact the Tobago Hospitality and Tourism Institute (THTI) at http://www.tobagothti.com. Good luck!